I work on a large web application using symfony 1.0, and we add new subsystems frequently, each having its own set of authorisation/security requirements. When we started writing the application, it was clear that we needed a unified permissions system that would be both simple to use, and highly flexible. I’ve talked about our solution previously on the symfony forum, but thought I would expand on it here by explaining how it works, and discussing some of the code. Firstly, it is worth bearing in mind that in a web-based system, authorisation to see something can be defined using three basic levels, which I will call “page”, “sub-page” and “data”. The page level is the simplest; it determines whether the presently logged in user (or the current anonymous user) has permission to access the current page. In symfony, this is done via sfGuard (for the Propel ORM) or sfDoctrineGuard (for the Doctrine ORM). If the user does not meet the requirements defined in the relevant security.yml, the requested module/action is not executed (and either an error or the logon box is displayed, according to settings.yml configuration). At the sub-page level, an item is displayed or not displayed according to whether the user has a particular credential, and at the data level, database rows are filtered according to further properties belonging to the user. I am sometimes asked what symfony does to achieve these second two, and the simple answer is – sadly! – nothing. This is because this level of authorisation is complex, and has to be handled at the application level; there is not much a framework can do to introspect what should be visible to each user. However, with a good framework to hand – such as symfony – we can handle both scenarios fairly easily. Here we have just modified a small screen element according to user credentials; it is, of course, quite possible to render whole blocks on screen differently according to what credentials a user holds. However, it is worth bearing in mind that if a screen radically differs according to user type, it is probably worth having two different templates, or even forwarding to a different action. We have user_main, which is our sfGuard profile table, as it has a 1:1 relationship with sf_guard_user. 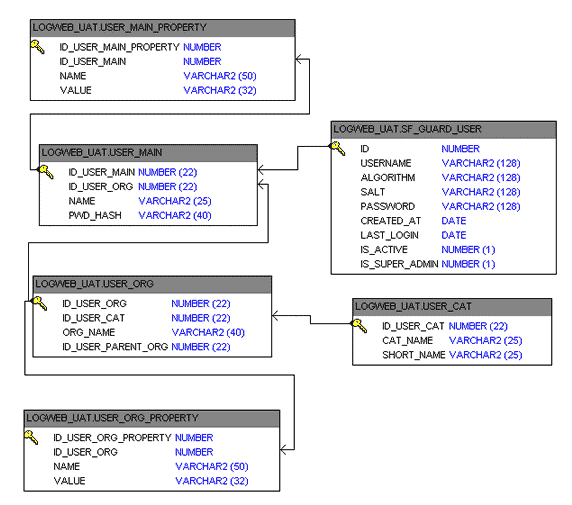 User-level properties are stored in user_main_properties; each user also belongs to a group, in user_org, and the properties at this level are stored in user_org_properties; and each organisation has a category, stored in user_cat. In the usual way, a custom user class is set up in factories.yml, extending sfGuardSecurityUser. Note that the database code uses Propel, but Doctrine could be used just as easily. * @param $strType the name of the type, usually "organisational" or "user"
a credential based on their user category, so a user belonging to a group which has a type of “client” will get a credential of “user_type_client”. This can be used in security.yml for page level access, or for sub-page level access as described earlier. all the user properties belonging to them, plus all the properties assigned to the user’s organisation. This permits data-level filtering; for example an organisational property of “depot_code”, containing the value “MYDEP” can be read from the user session, and then incorporated into a database WHERE clause. A complete user class, which also contains various getter methods to access property and category information, can be downloaded here. So **u1** should be able to add users to the application but only can see Group2 and Group3 under Groups Options, **u2** should be able to add users to the application to but only can see Group3 under Groups Options, so u1 and u2 shouldn’t add users belonging to Group1, how I can get this using sfDoctrineGuard? It’s possible? Hi Reynier, thanks for the comment. I am sure it is possible. It sounds like “u3” is just page-level authorisation, which sfGuardPlugin does out of the box – just ensure that your admin screen requires u1 or u2 as tokens, and this will happen automatically. For the second scenario – restricting what users can be seen according to group, you will need to do that at the application level. Where you have a database query, you’ll need to modify it according to group membership – use $this->getUser()->getProfile() to access the sfGuardUser object, and related classes I think can be accessed from there (if you use an autocompleting IDE it is made much easier). You’ll also need to actively prevent the saving of values in forms, so that users who do not have full admin permissions cannot create/modify involving groups they do not have access to. So, give this a go? If you are relying on the built-in generated admin, it may be better to write your own. I am sure the generated version is flexible enough to do what you want, but personally I found understanding it harder than just writing from scratch! If you get stuck, ask a Stack Overflow question, with the code you are stuck on, link it here, and I will take a look. Hi Jon, I found your blog from forum.symfony-project.org 🙂 I need a your support about the working with Symfony 1.4, Oracle Stored Procedure. there have your solution. But cannot download attachment files. Is it possible to share again them? Note that this code is five years old at least, and probably could have been improved at the time, likely more so now. That said, hope it is useful to you! If you find it useful and make changes, do put the results up on Github or something. Thank you for your reply. Your classes helped for me so much.